Excel Add-In for Sugar SugarCRM, Inc. 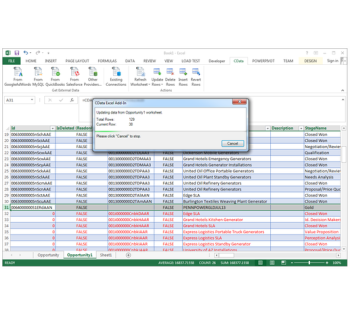 The Sugar Excel Add-In is a powerful tool that allows you to connect with live Sugar account data, directly from Microsoft Excel. Use Excel to read, write, and update Leads, Contacts, Opportunities, Accounts, etc. The Excel Add-In for Sugar is integrated with the Excel toolbar and ribbon, providing direct access to live data with a single click. Perfect for mass imports / exports / updates, data cleansing &amp; de-duplication, Excel based data analysis, and more! Your Sugar Data, Your Way! The Excel Add-In for Sugar provides the easiest way to connect with Sugar data. Users simply supply their credentials via the connection wizard to create a connection and can immediately begin working with live Sugar tables of data. The Excel Add-In is completely self-contained; no additional software installation is required.